This is possibly the most critical aspect. Look at the footprint of your product packs on the pallet. Are there any gaps? Could another pack be squeezed in somewhere? When working with a client recently we ran a successful trial in which we changed the footprint of the pallet stack which allowed an increase of one extra pack per layer or 12 packs per pallet. This yielded a 5.9% increase in product value per pallet and proportionately reduced transport costs. Essentially this means that the client can ship 5.9% more goods for the same overall transport cost. Are you column stacking or brick stacking your products? Column stacking is when the same footprint is maintained all the way up the pallet and cartons are stacked directly on top of each other. 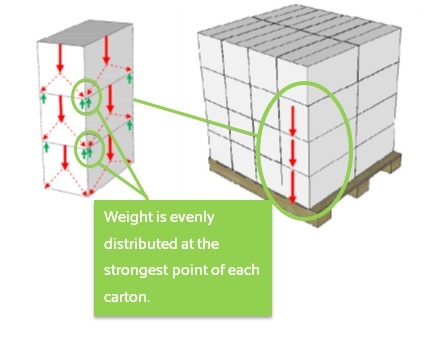 When stacking cartons the benefit of this is that the corner of each carton is stacked directly on the corner of the carton below giving maximum strength. This can sometimes allow economising on the board grade of the cartons too. 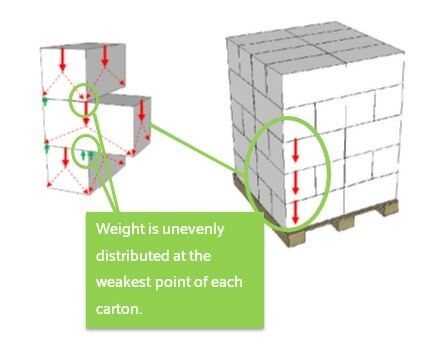 Brick stacking is when the footprint is switched every layer, so that the cartons interlock. 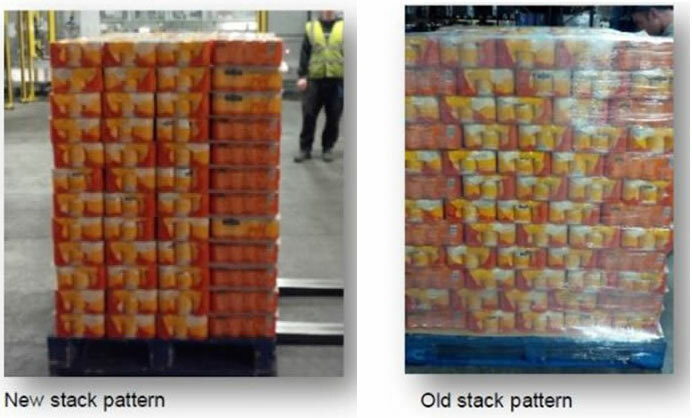 Often brick stacking is used as it is perceived to give a stronger pallet configuration, however when used correctly, column stacking can improve carton performance and pallet stability and also increase the amount of product per layer. A paper anti-slip layer sheet can be a cost effective way to improve the pallet stability. Will your client allow you to send in pallets where the product overhangs the edge of the pallet by 10mm or so? Ask the question! If it is not going to affect their operations then take advantage of this to alter your product footprint and squeeze more product on per layer. How high can you go? Are you taking advantage of the maximum stack height of your pallets? Have you had a discussion with your customer about how high you can go? Experiment with stacking this high using an anti-slip paper layersheet such as is demonstrated in this case. If you are concerned about pallet stability on the taller pallets also be sure to check the stretch on your pallet wrap. This plays an important part in keeping your product safe on its journey from you to your customer… but more about that in another post. Previous post Are you going to Foodex?